The eleventh stop on the BPCA Regional Forum 2018 road trip will be in Northern Ireland, on 5 December 2018 and is kindly sponsored by BASF. BPCA organise events around the country to bring together everyone with an interest in professional pest control, including technicians, business owners, manufacturers and distributors and industry experts. Full agenda below – register now to receive updates. Book your place today - event capacity is strictly limited. Why attend your Regional Forum? These events are a fantastic opportunity to network with like-minded professionals in your area, as well as to learn something new about your trade from some of the most interesting speakers in the sector. There’s always a few members of the BPCA staff team on hand to answer any questions you have about membership, training, events, technical queries or BPCA in general. On the Affiliate Scheme or from a Member company? Join us for free! 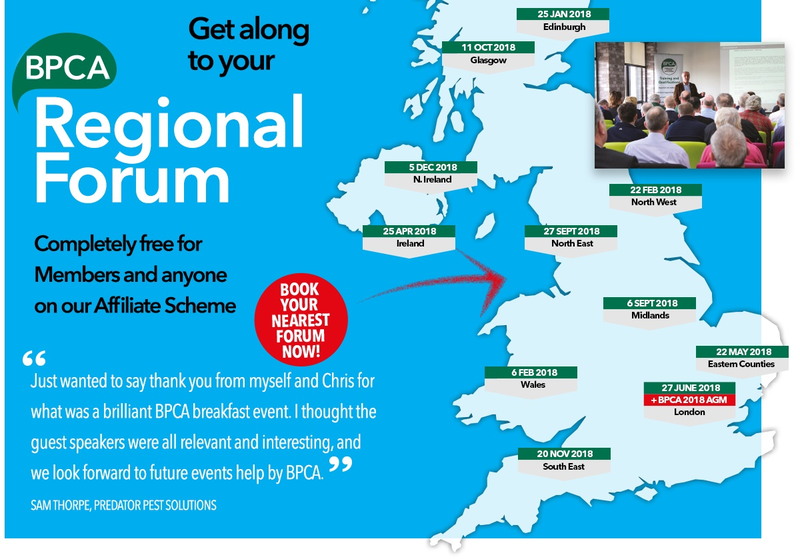 Our Regional Forums are completely free for BPCA Members and anyone on our Affiliate Scheme. The full agenda for the Northern Ireland Regional Forum is now published below. Attendance certificates with awarded CPD points will be given out at the end. DON'T FORGET YOU CAN ENJOY A FREE LUNCH SPONSORED BY BASF!